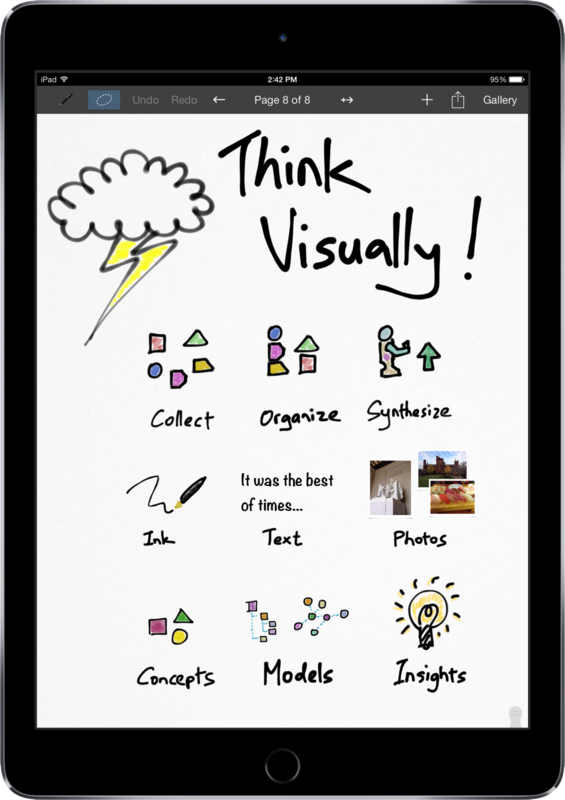 The Visual Thinker's Notebook for iPad and iPhone. Inkflow works like a Word Processor for Visual Thinking. Capture your ideas as easily as with pen and paper, then arrange and reorganize them with your fingers! Download it for your iPad or iPhone from the App Store. Inkflow's ink feels like a really smooth fountain pen. Great for expressive writing or sketching. Effortlessly scale or move anything you select. This will change the way you think about ink: Jot down a list of concepts then rearrange them to fit into the bigger picture. Literally move your thoughts around the page, and assemble big ideas with your fingers. This works great for brainstorming and planning. It's also perfect for prototyping layouts, sketching, and drawing. Zoom and pan with two fingers. Inkflow's ink stays sharp no matter how much you zoom in, so you can add fine details at full quality. It's also lightning fast and lag free. This allows writing and drawing with incredible precision, with or without a stylus. Only Inkflow Plus includes the revolutionary Inkport tool. Inkport uses your iPad's camera to instantly convert your written notes and sketches into Inkflow's native vector ink. Text, Photos, and Paper Stationery Too. Insert text boxes and photos anywhere on the page and resize them seamlessly with the ink. You can also choose from a selection of different paper backgrounds. We're sure Inkflow will revolutionize the way you work. Rather than just read more, go ahead and use Inkflow for yourself: The Standard Edition of Inkflow is completely FREE. ★★★★★ Inkflow is a very useful app! Read more reviews in iTunes. We strongly believe that the iPad is not just a consumption device. It's a creativity device. Thanks for supporting us in our journey of building creative Apps like Inkflow. We hope you enjoy it! Download Inkflow for Free from the App Store. Check out the Inkflow User's Guide for more details. We release new tutorials and resources from time to time. You can sign up here to hear about them first (it's low traffic, we hate spam as much as you, and you can unsubscribe anytime). Inkflow has become a favorite tool in classrooms across the world. It's perfect for taking notes, creating student digital portfolios, and doing assignments. You can buy Inkflow Plus at a 50% discount in packs of 20 or more for your school or business. We rely on our fans to help make people aware of our work. If you know someone who might benefit from our Apps, please tell them about us. You can also follow us on Twitter, or share a link to our website. Click here to share Inkflow with your friends on Twitter! If you would like to write an article about Inkflow on your blog or magazine, you can get high-resolution artwork and a text description in our Media Kit. It means a lot to us. Thanks. If you like Inkflow, you'll love the All New Vittle, which turns your iPad into a recordable video whiteboard. Inkflow was designed to help you capture and organize your ideas. Vittle is the ideal tool for sharing those ideas effectively with others. Find out more on the Vittle homepage. Don't forget to check out our other Apps as well.